Who takes the first move in a round? Whenever a Round card is turned to the ship side, the number at the right of the new Round card shows which player will take the first move in the new round: "1" is the Starting player, "2" is the next player, etc. This ensures that players remember to turn over the resolved Round card. In the shortened version of the game, use the lower number in the lightcolored box. 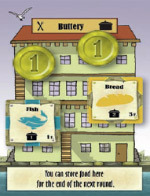 The Buttery on the reverse of the Game turn overview cards helps players to keep an overview of how much food they need for the end of the round. Players can place Food tokens in the Buttery to pay at the end of the round, or can place Food Production tokens here to remind them of the food that their ships provide. 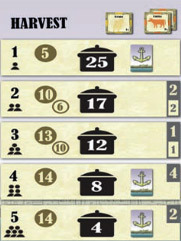 At the end of a round, a player should announce "Harvest" so that all players are reminded to take any grain and cattle that they have produced. It's easy to forget that buildings can be sold at any time. An inexperienced player might notice that he is unable to pay the entry fee for a building, and look for a different action. He might, however, be able to raise the entry fee by selling a building. 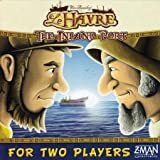 Towards the end of a game, it can be very worthwhile to rid yourself of cheaper buildings or Wooden ships. We suggest that players turn their building cards away from themselves, so that other players can read them more easily..
A Player need not wait for the previous player to announce that she has finished her turn before taking his turn. Rarely, a player might choose to sell or buy a building after taking her Main action. If she wants to do this, she can always ask the next player to wait a moment. The number of Round cards that are sorted out and placed in a pile during the game setup phase is always equal to the number of rounds that are to be played. Players can always tell what Round is being played by looking at the current Round card. In general, the order of play of the final actions is not important and they can be taken simultaneously. In the rare case that the order of play matters for some reason, for example when entry fees are paid or Luxury liners are bought, players should follow player order.